Alright, we’ll be honest – the only spooky thing about our sandwiches is how finger lickin’ delicious they are! All year long - Halloween included - we hold the tricks and serve up treats at Ross & Hall. For some much-needed sustenance before hopping around the neighborhood with the family, stop by Ross & Hall for any one of our sammies. No pressure, you can’t go wrong here! We appreciate melted cheese as much, if not more, than anyone! That’s why our menu has a couple of sandwich options that are just oooey gooey enough. Take our Caprese Grilled Cheese, a sandwich with just enough melt and just enough freshness. Fresh mozzarella keeps tomato, fresh spinach, parmesan, and pesto piled together between two slices of rustic white toast. For a sammie option with some protein to boot, give the Ross Black Forest Melt a try. Ham and gruyere cheese, white sauce, and a sunny side egg are served atop a brioche bun. Both of our pork-centered sandwiches will leave you wanting more. 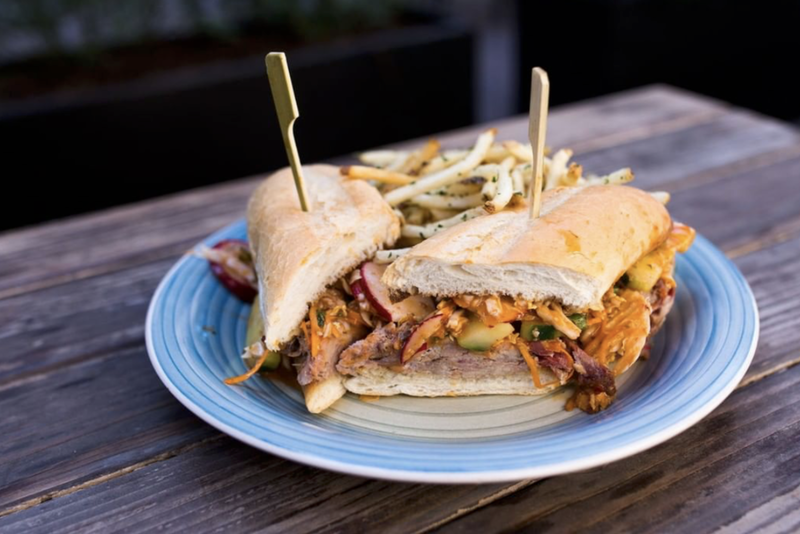 Our Smoky Asian Pork Bahn Mi is piled high and served on a baguette. Cilantro straw, Asian fire sauce, cucumber, radish, and spicy mayo make for the perfect layering of textures with just enough kick. The Pulled Pork Cuban we’re crafting features stutz smoked pork, ham, pickle, swiss, and spiced mustard on a baguette. These are just a few of the sammie options we’re crafting at Ross & Hall – we also have our R&H Smoked Turkey Club, Turkey Reuben, Chicken Sandwich, and Blackened Tuna Sandwich up for grabs. Regardless of which spooktacularly delicious sammie option you land on, you’ll have the choice of string fries, fruit, sweet potato fries, or a side salad to accompany it. We look forward to seeing you, costume and all!